In the year 2006, Steve Haddan will celebrate 25 years as one of Australia's most popular comedians. Importantly, Steve begins the year having just completed his busiest twelve months in the business. Clients like the Carbine Club, Harvey World Travel, Suncorp, the Australian Stock Exchange, McDonalds Australia, CUB, Visy Industries and Volvo Australia once again looked to Steve when the job had to be done. and Australian history and then worked with the Royal Queensland Theatre Company as an actor, starring in major productions for two years. giving a show stopping performance at a gala tribute to commemorate the career of the company's long serving Artistic Director, the late Alan Edwards. where he was one of the company's top salesmen. 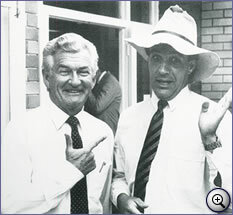 In 1985 he was the American Chamber of Commerce Xerox Australian Salesman of the Year. Since 1982 Steve had moonlighted as a comedian, but things stepped up in 1985. 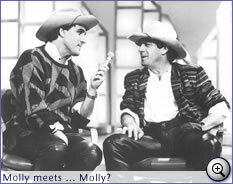 In a series of appearances on the Ten Network's hugely popular variety show "Star Search", an earlier incarnation of the "Australian Idol" concept, Steve cloned an uncanny impression of rock guru, "Molly" Meldrum. He now embraced national stardom. and his talent for selling, Steve became one of the country's most sought after corporate performers, engaged by the most demanding blue chip entities. of Radio Broadcasters "Raward" for the best new talent on Australian metropolitan radio. the first ever history of what is now the NRL. It was a runaway best seller. Two editions were published, with over 17,000 books sold. sports bulletin on the Brisbane edition of National Nine News. 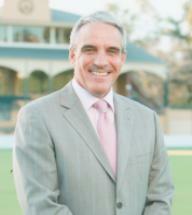 2006 is Steve's fourteenth year as a sports presenter and journalist with Nine. Meantime Steve's bookings as a comedian, after-dinner speaker and master of ceremonies continue to build. His clients all demand, and receive, the very best in quality entertainment. Steve's strengths are simple; he's good, he's funny, he shows up, he gets the job done. He knows the business and is dedicated to realising long term relationships with his clients. His attention to detail and love of his work has landed him in Europe, the United States and all major cities of Asia. On behalf of Jane and I, I would like to thank you from the bottom of my heart and belly for a fantastic party at Barambah on 16 October. Who would have thought that 250 people could be so fabulously entertained for 10 1/2 hours of continual action. and of course the acts themselves including your sensational Jo and Flo routine was spot on. I have received countless notes from people thanking us for the party and generally everyone says it was the best they had ever been to. From my perspective it was a wonderful day and something to savour forever. It was great you were able to take the pressure of us as organisers and allow us to enjoy the day so much. I look forward to catching up with you over a drink or two to reminisce and enjoy more. Kind regards Steven M. Wilson. How can we ever forget the 2002 evening at the convention centre. You did a fantastic and humorous job! ... there is no one better than you out there! Your presentation began with a send-up of me, my family and then Management and staff ... and had the crowd absolutely in laughter! Love you heaps ... and thanks for everything you have done; the Premier's 50th party; the launch; and the Christmas Awards! I just love you as a friend - and a working partner!